New Jersey Transit (NJ Transit) has implemented new technology upgrades at New York Penn Station, including an improved sound system, larger monitors and a multi-color destination display that will enable customers to see the next train destined for their particular station. 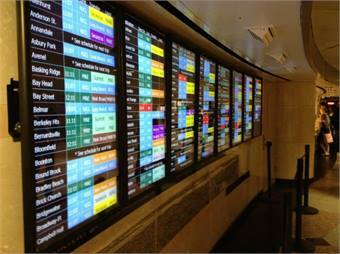 To make it easier for customers to identify their train, the 7th Avenue Concourse ticketing area now features a new destination display — eight monitors installed side-by-side that show an alphabetical list of destinations by station, along with the departure time for the next train headed to that station, track number, rail line and transfer station, where required. In addition, NJ TRANSIT added two large customer information displays at the 31st Street entrance and the 32nd Street entrance to the ticketing area. As part of this project, NJ TRANSIT also replaced all of the existing 40-inch monitors in the 7th Avenue Concourse with new 55-inch monitors to improve visibility for customers, showing color-coding by train line. NJ TRANSIT relocated the monitors throughout the 7th Avenue Concourse to allow better flow of customer traffic during peak periods. Improved adaptive audio system in the 7th Avenue Concourse that adjusts the volume level of announcements based on the ambient noise in the station. Wireless microphones for Customer Service representatives to make announcements from the concourse floor when needed. Located in Midtown Manhattan, New York Penn Station is the largest-volume passenger terminal in the NJ TRANSIT rail system, serving more than 150,000 customer trips on a typical weekday.